The new version of the Raspberry Pi sports a quad core ARM Cortex-A7 CPU running at 900MHz and 1Gbyte of RAM. This is equal to the notebooks of yesteryear. It’s no surprise that makers want to turn this $40 mini PC into a portable laptop solution. There have been quite a few successful attempts at this, although they usually involve a messy hack of various components. 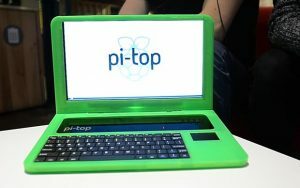 London-based Pi-Top has created a kit to turn your Raspberry Pi 2 into a complete laptop, with keyboard, touch pad and screen. The Pi-Top contains a standard laptop battery, that can run for up to 10 hours. The 13.3” LCD display supports a 1366×768 resolution at a 60 Hz refresh rate. This allows you to watch videos and play memory efficient games in high definition. 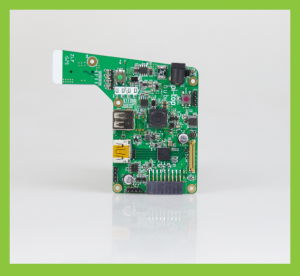 The included PCB main-board contains all the power management components, and a HDMI to EDp converter to control the display. You can charge the laptop using a standard 18V charger, and the battery can supply both 5V and 3.3V outputs. The 3.3V line is persistent, and will continue to supply power even when they laptop is turned off. The keyboard can be positioned anyway the user wants. You can switch keys around to match whatever layout your normal keyboard is. There are standard EU and US keyboard layouts available, but the keyboard is fully programmable to allow you to set up the keyboard in any manner of different funky ways if you wish. The track pad includes some clever sensor design, to minimise mis-clicks when resting on your hand on the laptop. Although the case is injection moulded, it is possible to 3-D print your own case if you wish. This may be useful if you want to integrate your own speakers, as the Pi-Top does not currently feature any speakers. All of the component boards are modular allowing you to pick and choose the components you wish to use in the laptop. If you buy the kit, you get everything you need to get up and running including the Raspberry Pi, an SD card bundled with the operating system, a Wi-Fi dongle and all the necessary cables to get started. The case provides support for USB, HDMI, Ethernet and a standard 3.5 mm audio jack. As the laptop uses a Raspberry Pi you can also interface a camera and a display. If you would like to integrate other features such as a web cam, it should be a relatively simple task to interface this to the Raspberry Pi, and edit the 3-D model of the case to print a mounting bracket for it. The plan is to ship the Pi-Top by the end of the month, so you can preorder your own Pi-Top now for only $300. This cost includes the Raspberry Pi itself. The whole thing looks pretty well constructed, and if you’ve always dreamed of making your Pi portable, then the Pi-Top will answer your needs perfectly.